Like many of you, my heart and prayers went-out to the seven sailors trapped in the Russian Sub over the weekend. What we did not learn until today was that if the Russian military had their way, these men would still be at the bottom of the sea. Thank to an anonymous phone call to a local radio station in the port city of Petropavlovsk-Kamchatsky, a chain of events was set-off that led to the rescue effort of the men. As a former sailor, I can imagine nothing more frightening than being stuck at the bottom of the sea as you slowly watch your air supply run out knowing that you can do nothing to save yourself. As a result of this mishap, word is that Russia has ordered two Scorpio rescue robot subs from the British. 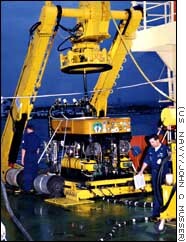 Above is photo of the US version of Scorpio robot sub.